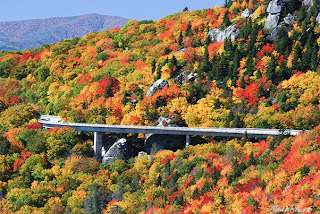 One of the most best overlooks I've found on the Blue Ridge Parkway is at mile #302.8 just north of the Linn Cove Viaduct and Grandfather Mountain. It's one of those overlooks that's easy to drive by, because you can't immediately see anything but a parking area. 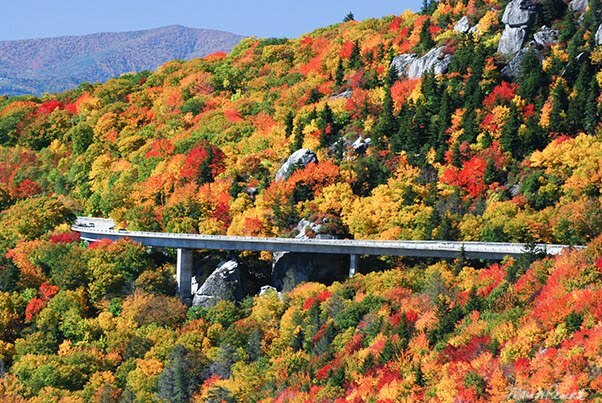 But take the short, moderately steep 1/2 mile trail, and you'll be rewarded with magnificent views of the viaduct, Grandfather Mountain and layers of mountain ridges to the south and east. After you get to the wooden platform seen above, continue climbing another half mile and you'll be rewarded with even more breathtaking views. The trail can be slick and muddy after a rain - wear old shoes. Because of the narrowness of the path, pets are not allowed. 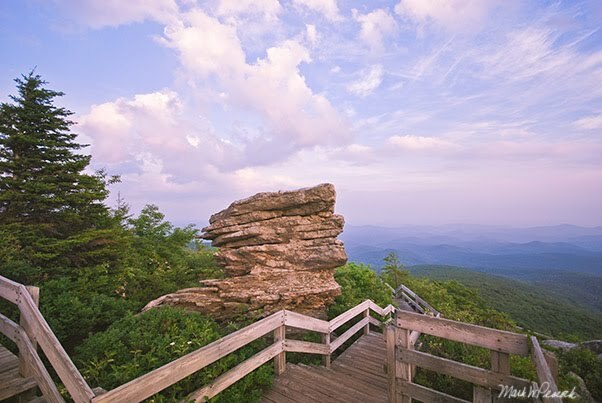 The trail to the lookout is part of the 13.5 mile Tanawha Trail which parallels the parkway and leads to Price Lake (Mile 297) to the north and Beacon Heights (Mile 305) to the south. Tanawha is the Cherokee word for "great hawk or eagle" -- which if fitting given the soaring views of the mountains it offers. 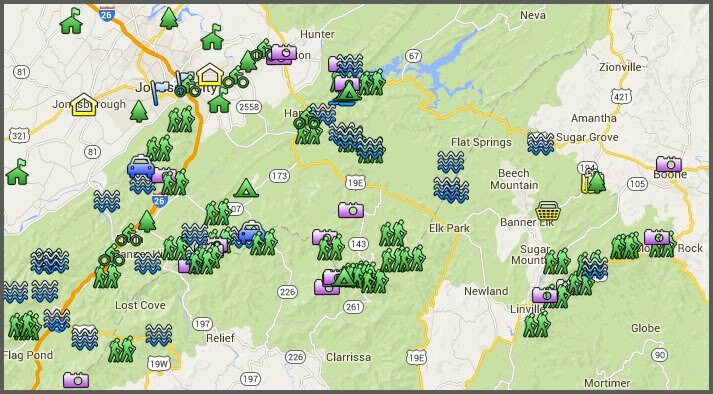 Click here for an interactive map of the trail. 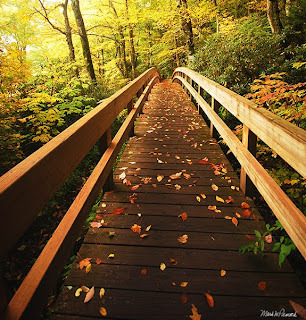 Above is a beautiful bridge found on the trail to Rough Ridge, one of many along the Tanawha Trail. Perhaps the best known of these graceful arched bridges is Boone Fork Bridge a few miles to the north on the Blue Ridge Parkway at mile 300. Does it make me less of a man that this picture made me tear up? It took more than 6 years to get an answer. The final answer is YES! The answer to the question about tearing up over the picture is an emphatic NO. I am having trouble understanding why so many men worry about whether crying or driving a certain kind of car or wearing a certain color makes them less of a man. Odd, indeed to have fallen for all the socially forced ideas about manhood. That said, lol, this is a beautiful trail with lovely views...oops, did I say 'lovely'? Does that make me less of a ....aw, nevermind. My husband and I are both graduates of ASU. He proposed to me by the rock stack in photo above at Rough Ridge Overlook in 2002. This is a very special place to us. This section of the BRP will forever be a favorite of ours. Now 14 years and 2 children later; we still return to take in the beauty.